Swedish entry into the European Union and Norway are members of EFTA, This two countries can be entered with Schengen Visa. That is, you can apply for a visa at the embassy of Sweden or Norway. Generally, Schengen visa may be filed in all Schengen member country’s embassy if we will be traveling to one or several Schengen member states, with the following notes. - If we just go into one Schengen country, must apply for a visa at the embassy of the destination country. - If you intend to visit several Schengen countries at the same time, you can apply visa Schengen at the embassy of the country is the main purpose for traveling in Europe. - If you want to visit several Schengen countries, but do not have a main destination countries, you can apply for a visa at the embassy of the first countries we visit. If we can guarantee form from the sponsor in Europe, we should apply at the embassy of the corresponding original invitation. The invitation letter is a letter of representations and warranties that the needs and living expenses while in Europe will be borne sponsor. Schengen visa application process will usually be much easier with the invitation letter, because the embassy assured we will not stray over in Europe. 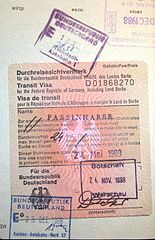 Schengen visas can be filed fastest for three months before the visit begins and no later than 15 days before departure day. Keep in mind, the process of obtaining a visa at the embassy of Sweden or Norway requires a long time, at least 14 days. So make sure you have enough time to apply for a visa. Also make sure all visa requirements are equipped so that you do not need to frequently visit the embassy and increase the length of time the Schengen visa application.